Van Hire Spain To UK - What Types Of Vans Are Available? Van hire Spain to UK, backed by a professional, expert removals company that has much experience in driving to the UK from Spain and vice versa, is a fantastic way to ensure that your belongings are safe. It is a great way to plan for a stress-free move and a far better option than driving yourself. What types of van hire Spain vehicles are available for your move and what are the differences between them? It is important to understand the options, as picking the right vehicle at the beginning will save a lot of trouble at the end. A van hire that is too small for your removals to Spain could mean multiple journeys which will increase costs dramatically. Your removals company should be able to offer you a variety of different vans for hire to the UK or Spain, and give you the best advice as to which one is best to use. The smallest type of van is the short wheel base (SWB). 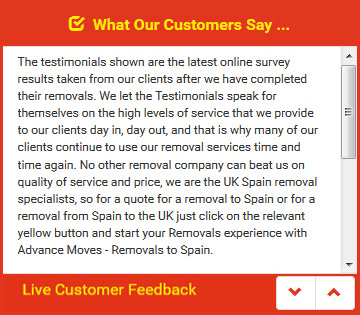 This is the preferred option for removals to the UK from Spain, or the other way around, if there is only a small amount to move. It is a small van that can hold some suitcases and a small number of boxes. The next size up is the long wheel base type of van to hire (LWB). Imagine a student�s flat � perhaps after finishing university � and this is the right size for that small amount of items which are mainly boxes rather than furniture. The third size is the large Luton van which can hold furniture and boxes � although strict weight limits must be adhered to. Advance Moves offers a range of different vans for van hire Spain to UK. Ask us which is best for your situation, and we will offer expert advice. See our website at http://www.advancemoves.com/ to get a quick quote. If you would like to speak to us, please call on 0871 218 0612 or email info@advancemoves.com.